We completed exactly 120 dives with the turtles. That amounts to over 70 hours of direct observation at the Turtle House, about 30 hours of videotape, and close to 800 photographs for this summer. In some respects, it is a good thing we have 10 months in Canada because that is how long it will take to review and log all the information accumulated during our dives. A song kept going through my mind much of the time we were on Maui: the Beatles' song In My Life--only I changed the word "places" to "faces." When I did that, it became my 1996 Summer Theme Song. Some I have known for so many years--Aikane, Raphael, Goofyfoot, Tutu--familiar faces and old friends. Some of the faces already had tumors when we met. Most developed tumors during the six years of observation. I guess that is how I can summarize what we do in our summers: faces and how they change. The turtles' world is so much richer than ours. It is three dimensional, and over the years the words we use to describe what we see reflects an avian world more than an aquatic one. Turtles fly, they don't swim. They take off and land. They are incoming or taking off or they are doing a circuit or a fly-by. Only what we describe as their trip to the surface for air (The Big Swim) hints at anything aquatic. We see them more as birds than reptiles. Their world is 3-D and much of it comes to them. 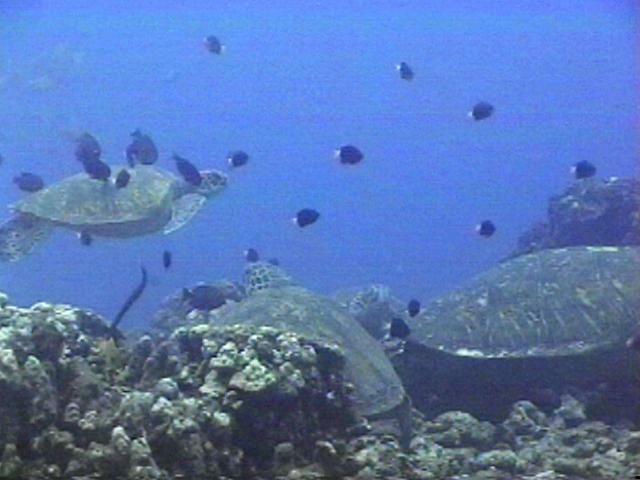 While resting on the bottom, all manner of small fishes and many of the bigger ones visit the turtles (and us). This summer a manta ray, eagle rays, dolphins, barracudas and a host of game fish have all done fly-bys. It is easy to envy the turtles, but a simple glance at them brings you back to grim reality. Almost all of the turtles have tumors. Those that don't are showing the "salt and pepper" that signal the disease has found another victim. We dive with disease and quiet suffering. We lose animals we have known for years. This summer five animals failed to show. The most painful loss was Howzit, a youngster we have known since 1992 and a daily presence each summer--until now. We saw turtles this summer we know won't be around for 1997. The tumor growths on eyes and mouth have already progressed to the point at which the turtle is blind and the cheeks bulge from the tumor growths inside the mouth. The plastron is sunken and the turtle is emaciated. That's the course of the disease and turtles simply move along this conveyor belt of misery. Right now I have painful withdrawal symptoms. Used to be I thought I missed Hawaii but that isn't it. I miss the turtles. I miss not seeing them or knowing what they are doing... how they are faring. The thing I hate the most is them dying without me there. Not that I would like to see a turtle die, but more than anything I hate the thought of special loved friends just dying all on their own and no one there to record their last few hours. Oh, we mourn their loss. We don't need a body for that. Turtles make it too easy on humans. The vast majority of fibropapilloma deaths never wash up on a beach or otherwise assault human sensibilities. They just die quietly so most humans never know what is going on or even remotely comprehend how many green sea turtles are lost to this disease annually. It would be quite something if I, with the snap of my fingers, could summon the shells of all turtles who have died from this disease and pile them up one by one. How many holes does it take to fill Albert Hall? Guess about as many as it takes turtle deaths to get the necessary funding and action to do something effective.